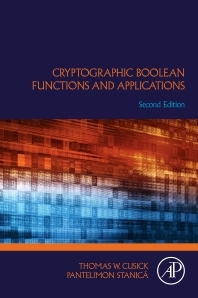 Cryptographic Boolean Functions and Applications, Second Edition is designed to be a comprehensive reference for the use of Boolean functions in modern cryptography. While the vast majority of research on cryptographic Boolean functions has been achieved since the 1970s, when cryptography began to be widely used in everyday transactions, in particular banking, relevant material is scattered over hundreds of journal articles, conference proceedings, books, reports and notes, some of them only available online. This book follows the previous edition in sifting through this compendium and gathering the most significant information in one concise reference book. The work therefore encompasses over 600 citations, covering every aspect of the applications of cryptographic Boolean functions. Since 2008, the subject has seen a very large number of new results, and in response, the authors have prepared a new chapter on special functions. The new edition brings 100 completely new references and an expansion of 50 new pages, along with heavy revision throughout the text. Thomas Cusick has 25 years of experience in cryptography, 60 published papers in that subject and 8 Ph. D. students whose thesis work was in that area. He is currently located at the State University of New York in Buffalo, New York. Pantelimon Stanica has more than 15 years of experience in the area of cryptography and Boolean functions, more than 35 papers in this subject and 3 Ph.D. students working in the area. He is currently located at the Naval Postgraduate School in Monterey, California.